A fad, unfortunate labels and a kennel in decline. One of these pups is from a high volume kennel that is trying to shut down. The power of marketing and personal fantasy is strong. Hundreds and hundreds of pups have been sold from this yard over the years, but the jig is up. Along with the breeder's announcement that she wants to retire (she's 72 and facing health problems) the County is demanding that she reduce her numbers by 80% - from 130 adult dogs down to 25 adults, or else. She's told us that she wants out of the puppy business altogether. Good news, since there are only so many families to go around who are ready for the built-in challenges of a high energy dog who carries the burden of a troublesome label. Dog rescuers have been shaking their fists at this breeder ever since her dogs started falling out of ill-prepared homes and into overcrowded animal shelters. So understandably, many scoffed at the news that she wants to retire and seemed to believe it was a ruse. 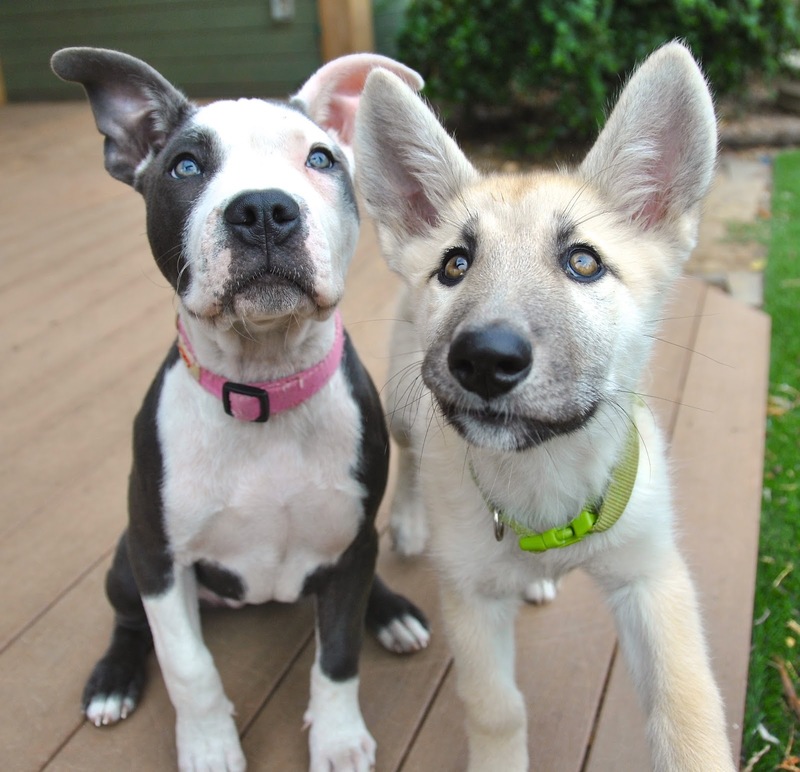 Animal shelters and rescues in many parts of the country are reporting a sharp increase in the number of homeless huskies and dogs identified (correctly or incorrectly) as Wolfdogs. We've walked this difficult path with pit bulls when Pandora's box first opened in the late 80's, so decided to contact the breeder last spring to learn about her plans and offer some help towards closing shop. She responded immediately. Getting to this kennel from the SF Bay Area requires a lot of driving and at least one overnight, so we dialed up rescue friend Shirley from Dogwood Animal Rescue, drove the distance and secured a veterinarian to join us. After introductions, we surveyed the endless rows of haphazardly built pens filled with dozens of bouncing, barking dogs and did a head count while trying not to look too shocked. On that day there were two hundred and twenty two (222!) dogs and puppies. As you can guess, with only two people on-site to provide care, the conditions were less than ideal. Before you curse the breeder, remember that this situation is alive and well because it's been supported by hundreds of buyers over the years who desire her product. No buyers, no producers. While we were there, we watched a buyer trade a frightened pup for fencing material and we held the space as the veterinarian euthanized eight troubled dogs at the owner's request. It was a tough day. Shirley unloaded a car full of donated kibble and filled it back up with four scared-to-pieces pups and one adult to head back to her rescue for TLC and rehoming. Since that visit, we've organized the spaying and neutering of the small group of adults the breeder is intending to keep. We started lists of dogs from the site titled, 'Possible Rescue Candidate,' 'Not Adoptable,' and fretted over the impossible details with our most experienced rescue and disaster response colleagues. No one seems to know how to help, to be honest. The skittish behavior of so many under socialized, escape prone dogs requires special management, but rescues are already overwhelmed with sheltered husky type dogs who've been falling out of homes. Best Friends Animal Sanctuary is full and the very real problem of hoarding in lesser known sanctuaries is pushing responders to the wall. Funders we spoke with were unwilling to engage due to the high number of dogs who would likely be euthanized due to lack of rescue options. Some suggested that the breeder's dogs could only be helped if they fell into extreme health crisis. Then, they said, funders would allow for a disaster relief response. Until then, there were basically SOL. In July, a transport brought eight of the breeder's puppies down to Oakland. They'd been destined for sale in a Walmart parking lot - it's how the breeder buys kibble for so many hungry adults - so we took them on to help them out, but also as a bit of an experiment. What would they be like? What kind of owners do they need? 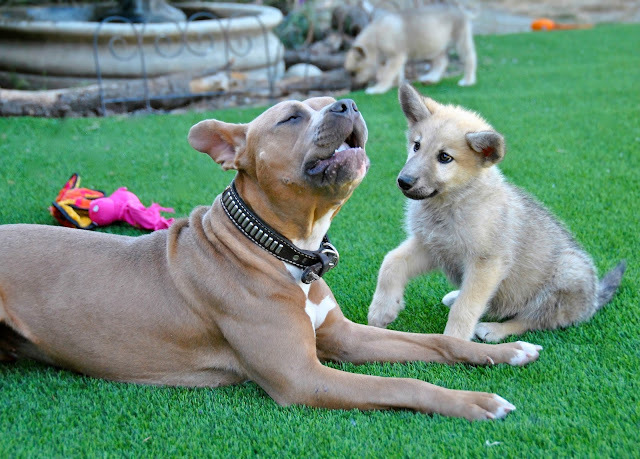 It was clear from day one that the pups were feral and we had a big job on our hands. Wolfdog behavior? They barely look the part. Trusted Wolfdog experts believe that most of the dogs from this kennel show "low or no" wolfy content. 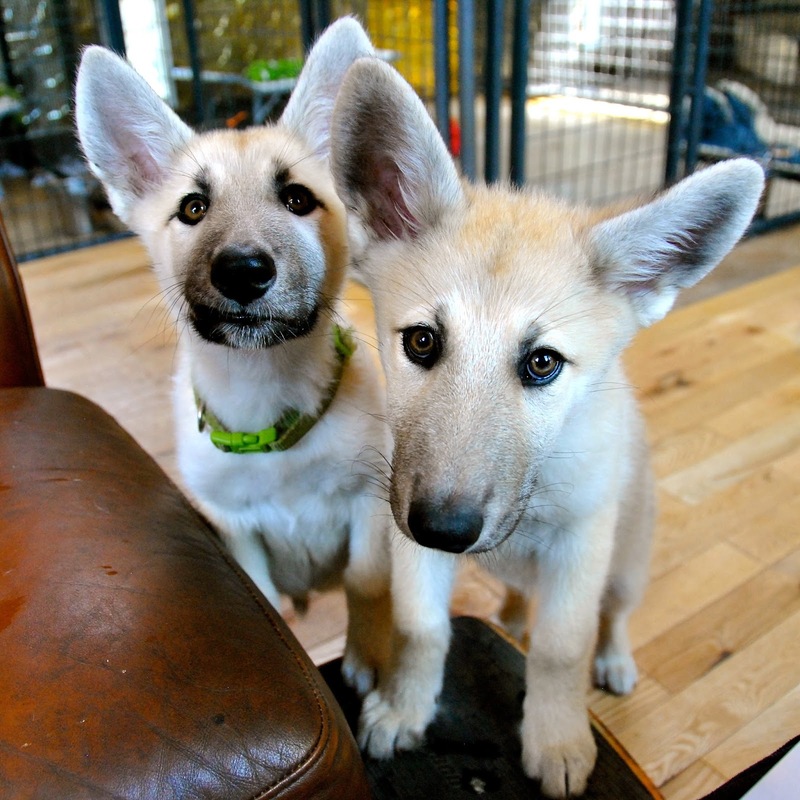 They're mostly husky-german shepherd mixes, they tell us. And boy are they shy. It's not uncommon for generations of tightly bred dogs who have no life outside of their pens to produce timid, socially insecure pups. 'Puppy mill behavior,' it's called. The pups ran and hid from us like wild raccoons their first days here and screamed all night for their mama. It was a long first few days. To wriggle their confidence up a notch or more, we brought in the best reinforcements: Cans and cans of soft food, spoons and human vending machines, and our secret weapon - some of the most human friendly dogs known to humankind. Pit bulls, of course. Since day one, social butterflies Scamp (below), Hennie and Bernadette have been modeling the most ridiculously friendly behavior towards humans imaginable. While the pups now ADORE the dogs, humans are still relatively low on their list of must-haves. Except when we have food, which makes us extremely popular with them several times a day. Baby steps - but progress. Our modest attempt to help another misrepresented 'breed type' has been educational, to say the least. 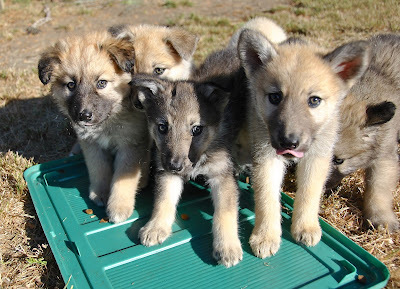 Wolfdogs! The name alone brings bragging rights to starry-eyed buyers, but sets their dogs up for real trouble with animal control agencies if they find themselves loose. Many animal shelters opt to euthanize dogs who they suspect may be a Wolfdog, and base their decision on nothing more than what they perceive to be a wolfy appearance. This no-mercy trend has been fueled by negative messaging in much of the language currently used in animal welfare circles. The ASPCA for example, who helped break huge barriers for pit bulls with their work on the Vick case, recently assisted with a well publicized rescue mission of husky looking dogs in Wisconsin. 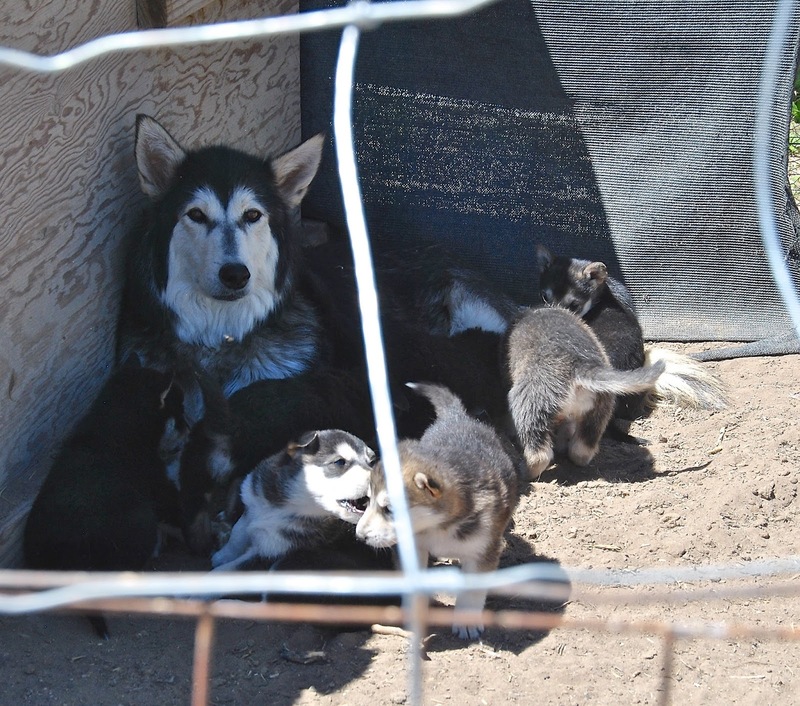 They described the seized dogs as 'Wolf hybrids,' and suggested their gene mix made the animals potentially unpredictable and dangerous. The problem is, the dogs who go along with those warnings can look very much like companion animals many have in our homes - including our own. How do we tell them apart? It may be impossible. The ASPCA contradicts their warnings by pointing out the fallibility of using visual examination to determine content in their same statement - A reminder that the animal welfare world is still trying to figure it all out. In instances where a dog's breed mix is questionable, some animal control agencies will fall back to the label that the owner chooses to use. A dog owner who brags that his husky is a 'Wolfdog' can be condemning his pet to death if that dog is seized. DNA tests that look for wolf content markers have become popular, but are not 100% reliable. Their use has fueled passionate debate when dogs like Karma, who for all intents and purposes appears to be a full breed husky, came up positive for a trace amount of content. That trace amount nearly cost Karma her life. 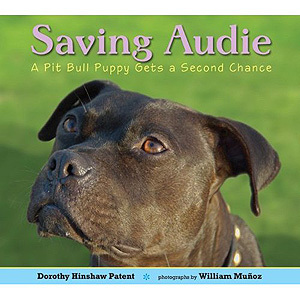 Remember the days when any dog suspected of having a trace amount of pit bull was labeled and widely condemned by municipalities and animal shelters with breed bans? Who are you? What makes you tick? And, especially, What do you need to succeed? With help from other rescues (thank you Family Dog Rescue and Norsled) we were soon left with four pups: The intelligent Stella, the gorgeous, impulsive Winter and their still-figuring-it-all-out sisters, Foxy and Baby Face (right). The girls required very special placements, including patient, husky-savvy humans, one or more well socialized dogs to serve as their anchors, and escape proof homes (ie, proper containment and good fences). Whatever we decide to call them, dogs who've been labeled correctly or incorrectly as Wolfdogs are being exploited and harmed by their label. They deserve our compassion and the very best game planning from the animal welfare world who is ultimately charged with dealing with them when they fall into crisis. Pit bulls, after all, hammered the lessons home by showing us that condemning any breed 'type' based on nothing but physical appearance and negative stereotyping is inhumane and does nothing to push the needle to a better place. EDIT: Updated news from Jan 2018 on the 'retirement' of High Desert Wolves. Chappy and Crystal: A team like no other. We couldn't be prouder of 'Barn Dog' graduate Chappy who first came to us from Contra Costa Animal Services and is now serving as a service dog for his adopter, Crystal. Crystal is a war veteran and like so many coming home, she's challenged with navigating the world with debilitating post traumatic stress disorder (PTSD) from her time in Afghanistan. Chappy provides comfort, but even more, his full time job is to keep close tabs on Crystal's emotional state and to signal to her when he notes that her stress is mounting to the point where she needs to sit down and regroup. 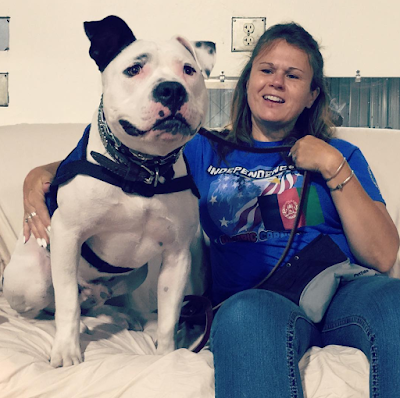 Chappy found his calling when Operation Freedom Paws came looking for a special dog for Crystal. They needed a dog who was comfortable with the world, relaxed around bigger distractions including other animals, and highly tuned in to people. They were also hoping for a snuggler with a goofy side to help lighten the mood when her painful migraines creep in. As it turns out, this velcro clown had all the right stuff and took to his job almost immediately. As a service dog who's been specifically trained for his job, his work is recognized by federal law and supported through the American Disabilities Act (ADA). He's allowed to accompany Crystal to all businesses open to the public, including restaurants, hotels, taxis, stores, hospitals and medical offices, theaters, etc.,as she moves about her day. Full time support. "When a person has PTSD, s/he scans, constantly looking for that threat. The least movement or sound kicks in the "fight or flight" process, which adjusts body chemistry and body language. Adrenaline is as addictive as heroin, and for a lot of people, living in that state of anxiety becomes their normal. Their bodies never stop producing it, so they never truly relax. Even when they're asleep, they're having nightmares, and rarely sleep more than a few hours at a time. Then they're awake -sometimes for days. 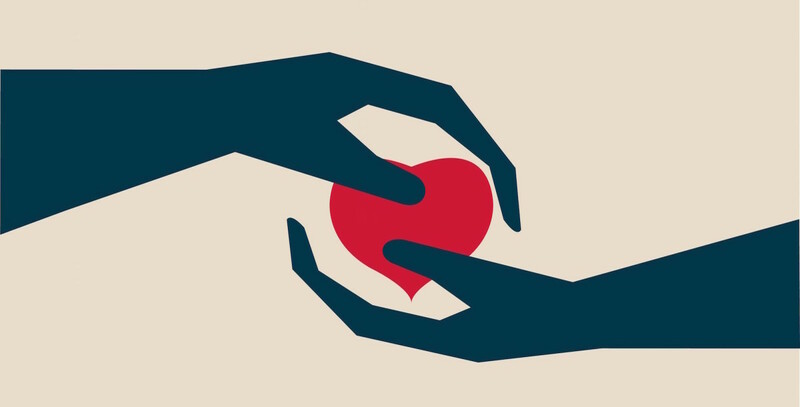 Trauma physically changes the brain. Basically, the conscious mind loses much of its control over their brain's natural reactions. Someone with PTSD lives in a state of constant heightened anxiety. Life in general is just too overwhelming and overstimulating. This causes them to isolate, sometimes for decades at a time. If they go out, even to the grocery store, it's at 3:00 AM. Usually the only place they go during the day is to medical appointments, where they're usually given meds to help them sleep, wake up, cope with pain, etc. These can add to the problems, especially for vets whose VA docs don't always talk to each other about patients they have in common. Psychiatrists at the VA see their patients about every 3 months, if they're lucky. Most self-medicate as well, with alcohol and drugs on top of their meds. It's a very dangerous situation for them and the people around them." So where does the dog come in, and how does it help? 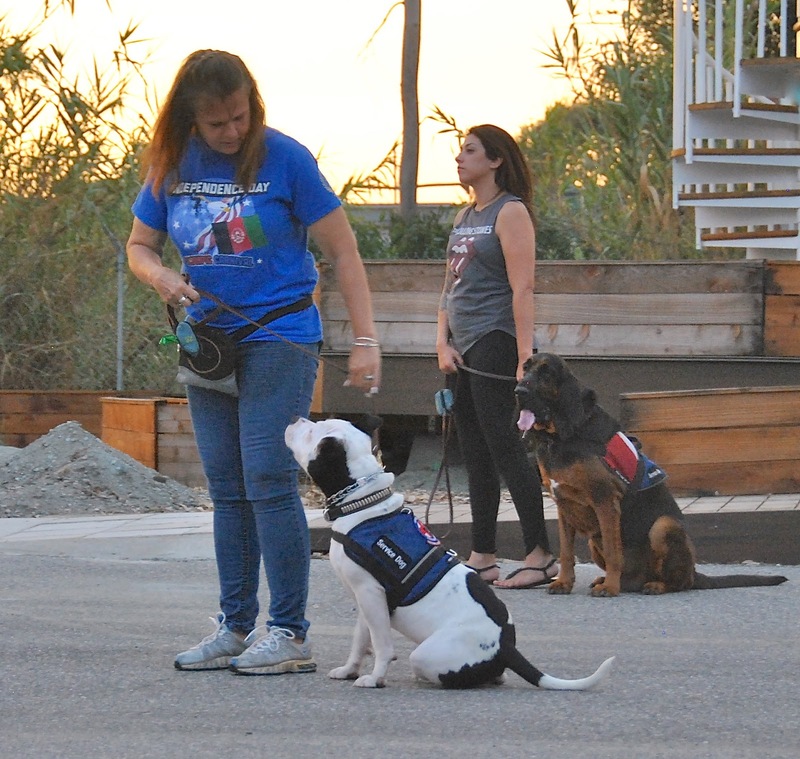 "First, when accepted to this program, they have to take the dog out for walks. We require in our contract that clients get out of their houses at least two hours a day, even if it's just to walk around the neighborhood. They have to be in our classes twice a week AND do their homework to solidify the skills they learn in class. And the dogs don't lie. We always know if they've been doing their homework or not, and we don't hesitate to call them out! This training is designed to create new habits to overcome the bad habits their brains & bodies have gotten into since they were injured. During class, all of the instructors observe each team---the dog, the handler, and their interactions. 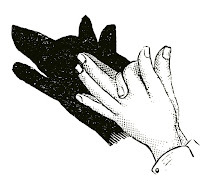 If a dog is reluctant to do something we KNOW s/he knows how to do, we say, "What's your dog trying to tell you? Do your inventory. Are you in pain? Are you thinking about something you shouldn't be thinking about? Are you getting angry? Take five!" 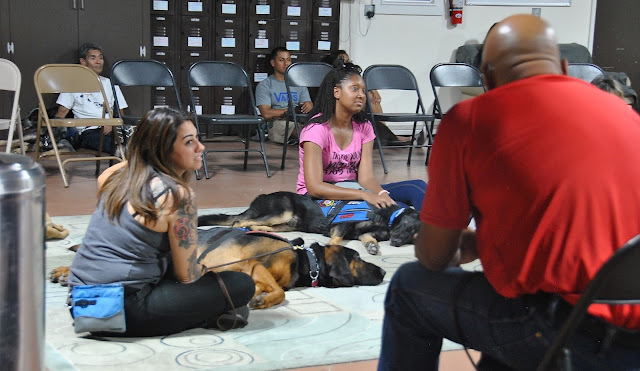 When we visited class at OFP, we learned that some dogs will signal by nudging their people or by stalling out and blocking their path. Some will wake their handlers up from nightmares to comfort them. Each team works differently and relies on the dog's particular skills to surface as the pair begins to bond. One dog shoves socks into the hand of his person during particularly stressful episodes and another lies across his person's legs. Below. After training drills, veterans practice what's called 'Doggy Yoga Hour' with their dogs and share personal triumphs from their week with the group. Yes, that's a bloodhound there! Chappy was more at home and happier than we've ever seen him when we visited. "He has a purpose now," said Mary Cortani, who started the program in 2010. Yes, he does. What a gift this program is to our veterans who participate and to the dogs who are lucky enough to find their destiny through serving them.